AFDAFSDK. Please note my acute frustration as my internets refuse to load SL for me, and I can't find slurls to anything. It's the last day of a few events -- the Armoire Jewelry event, and the RFL Clothing Fair. 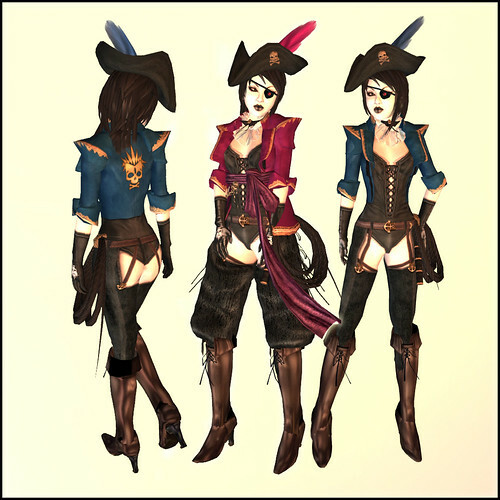 This Bare Rose pirate outfit (with the usual inimitable range of options and colors) seemed like an appropriate outfit to don for the last day of the fair. Bye bye fair! Bye bye Armoire Jewelry thingie! It's also the beginning of a few things! Exile and shine have a new sim, and Sakuradawn posted about it here: Newness from Exile and Shine! 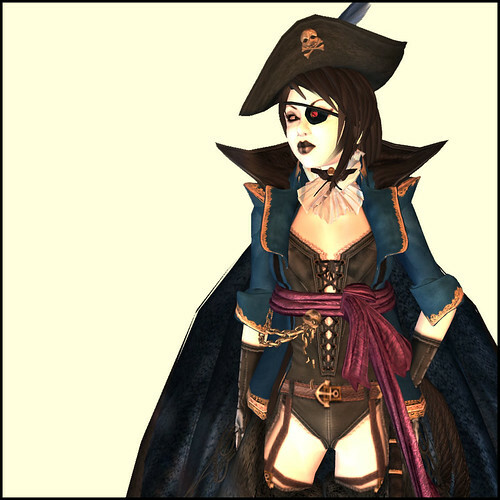 ***Outfit: Pirate Costume 3 from Bare Rose. Everything's in this one outfit folder, hat, boots, a billion colors, gloves, even a wound-up rope. Assless chaps = a very good reason to procrastinate. *laughing* ... I can't deny that.